Association asked to promote An Leabhar Aifrinn (the Irish language translation of the new edition of the Missal) which is expected to become available in 2017. Cumann na Sagart has been commended by the Irish bishops for its work in providing texts and translations of liturgical and spiritual resources in the Irish language. At their summer general meeting, the Irish bishops’ conference paid tribute to the Cumann’s efforts to awaken interest in the Irish spiritual tradition by promoting the history, literature, oral tradition, hymnody and devotional aspects of the Irish language. This year, Cumann na Sagart is celebrating the centenary of its foundation on 1 February 1916 at the Maynooth Union meeting of that year. To mark that special milestone, on 6 June, the Primate of All Ireland, Archbishop Eamon Martin was chief celebrant at a Mass in St Patrick’s College Maynooth to commemorate the centenary. The preacher was Bishop Philip Boyce OCD. 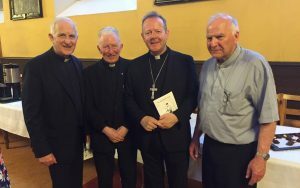 During their conference last week, the bishops congratulated Cumann na Sagart on reaching its centenary year and for the excellent work the association has undertaken over the past one hundred years in supporting priests and religious ministering in Gaeltacht areas, in gaelscoileanna and Irish speakers involvement in the liturgy across the island. The bishops asked Cumann na Sagart to promote the new An Leabhar Aifrinn (the Irish language translation of the new edition of the Missal) which is expected to become available in 2017, and encouraged each parish in the country to obtain a copy of the Irish Missal when it becomes available. Speaking with Tuairisc.ie ahead of the centenary Mass, the president of Cuman na Sagart, An tAth Séamus Ó hÉanaigh, said that it is vital that priests are available to serve the Irish-speaking communities. “Despite all the changes in Irish society and the enormous challenges we face today, it is necessary to serve the Irish community in general, as well as the Gaelteacht,” he said.